For centuries, Japan has celebrated the return of spring with ohanami​ - parties beneath the blossoming cherry trees with food, drink, and entertainment. Welcome spring with this fun tradition right here in Philadelphia. 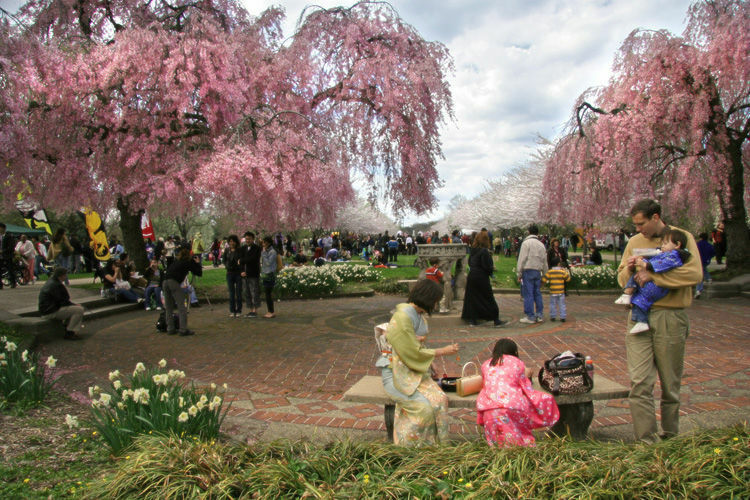 A project of the Japan America Society of Greater Philadelphia, the Subaru Cherry Blossom Festival is a celebration of Japanese music, art, food, and culture. Festival events are held all over Philadelphia and its suburbs. The main day of celebration, Sakura Sunday, will be held at the Horticulture Center in Fairmount Park on April 14. In 2019, festival events will be hosted in Center City, Fairmount Park, Chestnut Hill, The Main Line, and many more locations. For a full calendar of events, you can visit the festival website. Check out these great events and share your favorite memories with us on Twitter, Facebook and Instagram @Phillyfunguide! Morris Arboretum celebrates the Japanese Cherry Blossom Festival with a variety of activities on two Saturdays this April. The events are for both children and adults, and will celebrate the art, culture and gardens inspired by the 35 varieties of cherry trees that grace the Arboretum with their blossoms each spring. "Spring" into Cherry Blossom season with this fun race! As you run (or walk) along Fairmount Park's historic Centennial District, take some time to really enjoy the cherry blossom trees in full bloom, and the sights of Memorial Hall and the Japanese House and Garden. There will be 10k and 5k course options available. Sakura Sunday is held at Fairmount Park’s Horticulture Center, home to hundreds of blooming cherry trees – including two from 1926. Bring family, friends, pets, and a picnic and enjoy a beautiful day of arts and culture beneath the blossoms! Find half-price deals for fun events every week on our Funsavers page! Philly Celebrates Jazz all month long this April!